ABOVE: Chalets in Beatenberg, above Lake Thun. A century ago, the hillside village of Beatenberg, near Interlaken, was a health resort frequented by tuberculosis patients who came for the fresh, crystalline air. Even now, the village has two private health clinics, although most of today's visitors favor hiking or skiing. Beatenberg has some 30 km (20 miles) of marked walking paths in the immediate neighborhood, and skiers of all levels can make advantage of five lifts serving ten pistes--including a chairlift to the summit ridge of the Niederhorn, 6445 feet or 1950 meters above Lake Thun. If you're looking for a taste of the "real Switzerland" within commuting distance of Interlaken, Beatenberg is worth investigating. The village has nearly a dozen hotels and guesthouses, from the imaginatively modern Dorint Hotel Blüemlisalp to the Naturfreundhaus (Friends of Nature) hostel and the Berghaus Niederhorn at the upper station of the Niederhorn chairlift. Vacation apartments are another option. In addition to hiking, you can enjoy paragliding from Beatenberg or the Niederhorn--an activity that offers wonderful views of the Thunersee-Interlaken-Jungfrau region, although it's not for tourists with faint hearts or thin wallets. 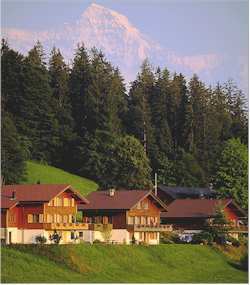 Even if you don't stay in Beatenberg, it makes a pleasant excursion from Interlaken or Thun. And for visitors who aren't carrying much luggage, it's also a pleasant side trip on a journey from Bern to Interlaken. The online encyclopedia covers the basics with historical, geographic, and demographic information. Switzerland Tourism provides a good introduction to the "sun terrace of the Bernese Oberland." Beatenberg's "house mountain" Web site has timetables for funiculars and chairlifts. Click "Getting here" for a map and a preconfigured SBB (Swiss Federal Railways) interactive journey planner. This page describes Swiss Postal Bus service between Interlaken-West and Beatenberg. Our discount booking partner is Switzerland's largest reservations service. It listed nearly a dozen hotels and self-catering apartments in Beatenberg the last time we checked. If you're hosting a group, you might inquire about renting this house from the YMCA. Glide from the Niederhorn or another peak in the region. Rates include photos and a video. Choose between "Big Blue" (1 hour, including 10 to 20 minutes in the air) and "Double Air Time" (90 minutes, with a flight time of 25 to 40 minutes). This article has links to tourism, hotel, transportation, entertainment, sports, and other Web sites for Interlaken and the Jungfrau region.